Winter is THE season for holiday and Christmas travel and THE destination for fans of anything holiday-related, is Europe. While nowadays most countries have embraced the holiday craze, one has to admit that Europeans do Christmas better. The Old World is where it all started and is still the place to experience the most wonderful time of the year. Christmas Markets are just one example of a myriad of unique European Christmas traditions that date back hundreds of years and are as diverse as the countries celebrating them. Travelers abroad have many options to experience the Christmas markets, because, in Europe, Christmas lasts much longer than a day or two. Christmas is an actual season, kicking off with Advent in late November and stretching into January, depending on the country. As there are too many great European Christmas traditions and destinations to list them all here, the focus of this iNSIDE EUROPE SCOOP is to spark interest or Vorfreude (German for ‘Joy of Anticipation’), to take the road less traveled, and to discover some new places in addition to the big city celebrations. In Deutschland, even the tiniest village will deck its streets and halls for the holiday. An iNSIDE EUROPE favorite (“Geheimtip”) for Christmas Market aficionados is Heidelberg (pictured above). Another special place to celebrate the season is in Leipzig. Did you know that Saxony claims the title of “Weihnachtsland”? This state in the heart of the country offers the largest density of Christmas events in Germany, not just in season, but all year around. Leipzig offers also one of the earliest Christmas Markets to welcome visitors. 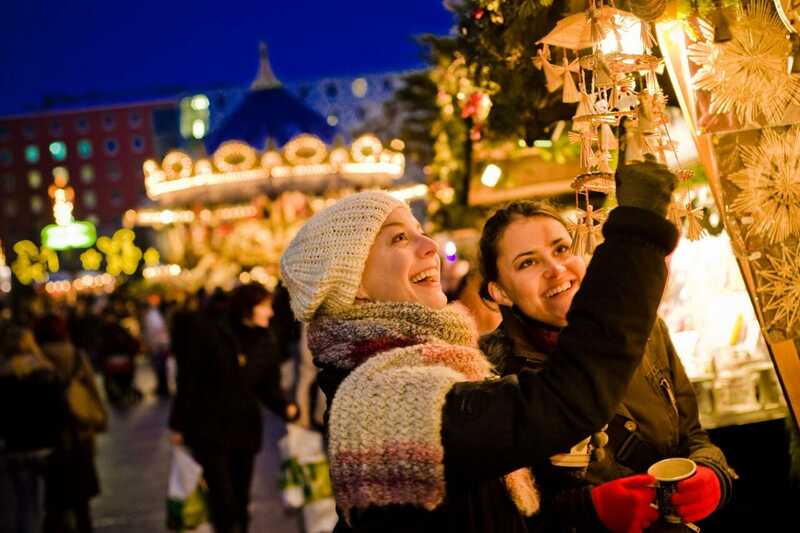 Starting November 28, over 250 twinkling stalls await locals and visitors in six areas, blending harmoniously into the historical setting of the beautiful Leipzig city center. It is not only one of the oldest, but also one of the largest Christmas markets in Germany dating back to 1458. What makes it so unique is the wide range of offerings. There is a medieval market with all the trimmings, the historical “Ancient Leipzig” fair with traditional crafts and art, a Finnish Village, and even a Fairy Tale Forest. Looking for something smaller, even more local? Follow German poet Wolfgang Goethe’s advice and “make your way to Speyer.” This UNESCO World Heritage city offers one of the longest celebrations, with the market in the historic center beginning on November 27 and ending on January 7, 2018. It is undergoing a rebranding from Weihnachts- to Neujahrsmarket after being closed on December 25th and December 26th. Special attractions here are a cultural Advent calendar, the lights, music, and fireworks show, “Altpörtel in Flammen,” and rotating offers from Speyer’s sister cities. The iNSIDE EUROPE bucket-list place to visit here is the “Kinderbackstube” bakery for children, open in the afternoons. Children may stencil, decorate and bake their own Christmas cookies on-site for a nominal fee, under the supervision of volunteers from a local child welfare organization. Priceless memories and honestly, some of THE best Weihnachtsplätzchen we have ever had (possibly because the little baker was our very own Thea, the youngest member of team Europe Insiders). Check speyer.de/weihnachten to learn more. Augsburg in Bavaria is home to one of Germany’s oldest Christmas Markets, dating back to the 15th century. Originally, just locally produced gingerbread was traded. This signature item can still be found today among many other products. Known officially since 1949 as the “Christkindlesmarkt,” the decorated booths and attractions form a village within the historic city center with offerings for visitors of all ages. What date does this start? Every Friday, Saturday and Sunday at 6 p.m., plus on December 23rd, twenty-four local girls, dressed as angels, appear on the beautiful facade of City Hall to transform the building into a huge Advent calendar. THE unique holiday feature of iN Augsburg is the “Engelsspiel” or “Angel Performance”. Charming facial expressions, graceful movements, and musical talent are ‘required’ to become an Augsburg Angel. The performance was created in 1977 and inspired by a painting from Hans Holbein. Video recordings are available online, but nothing beats the live experience – ideally with a glass of Glühwein (mulled wine) in hand. For further reading and as inspiration for Christmas routes along the roads less traveled in Germany, visit the Historic Highlights of Germany website. France may not be the first country that comes to mind for Christmas Markets, yet the Alsace region, Dijon, and Burgundy should not be missed. Founded in 1570, Strasbourg’s Christmas Market is the most famous, thanks to its sheer scale and location in Europe ’s capital. “Christkindelsmärik” in Place Broglie is considered to be the oldest Christmas market in France. Today, numerous town squares host the emblematic wooden huts of the Christmas Markets, and each has its own unique characteristics. A great place to stay for travelers with or without children is the Sofitel Strasbourg Grande Ile. This beautiful hotel is part of our iNSIDE EUROPE SIGHT-SLEEPING collection and is an ideal choice for individual travelers, families or even large groups. Most visitors just come for the day, but staying into the evening and ideally overnight is highly recommended by our Europe Insiders. This is equally true for Colmar, France’s second most visited and very charming Christmas Market. iN Colmar, you can celebrate until December 30, 2017. Last, but not least, the Marché de Noël de Dijon features burgundy wines, locally produced cheeses, charcuterie, mustard, ice-skating, and illuminations — it is worth the detour to this favorite wine region. Another highly recommended pre-Christmas excursion from Paris is to Maincy, where the always magnificent Château Vaux-Le-Vicomte positively sparkles for the season. Austria is another iconic European Christmas destination. During the four weeks leading up to Christmas Eve, charming Christmas Markets pop up in every Austrian town, big and small, all over the country. Get an overview of the multitude of Austrian Christmas Markets here. In addition to those listed, two more recommendations are the Christmas Market on the Freyung (Vienna), with lots of handmade gems (www.altwiener-markt.at) and the Christmas Market in Steyr (Upper Austria). For a one-of-a-kind authentic Austrian holiday immersion, why not stay at aRosa Kitzbühel, another iNSIDE EUROPE sight-sleeping hotel. The five-star resort hosts its very own Christmas Market for its guests in the stunning castle setting. Other festive offers include a special Christmas sauna infusion with music and gift wrapping services, to name just two more perks. It is not too late to make reservations! The list of European destinations celebrating the holidays in festive style goes on and on. You name the country, especially the predominantly Christian or Catholic ones, and Christmas is celebrated extensively: Italy, Poland, Portugal, Switzerland, etc. There is one country that may not be an obvious Christmas holiday destination, but has a lot to offer: Spain! Spanish celebrations are deeply rooted in tradition and great fun, too. Let’s start with Madrid, where you are unlikely to encounter snow, yet will be greeted with a city transformed during that time of the year with impressive festive light displays and plenty of sparkle, too! You will happily find a Christmas Market featuring the traditional mulled wine, and the city’s iconic sweet treat of authentic Spanish hot chocolate and churros. A must-see here, and in practically every town and village, are the varied nativity scene displays usually created by artists: traditional and living, and in miniature or life-sized. The tradition of creating nativity scenes iN Spain to commemorate the birth of Jesus is thought to be some seven centuries old. Most towns and villages install a crib scene in their Plaza Mayor square, in their churches, and in every home. Many of the nativity scenes have evolved spectacularly, and now include moving pieces and special effects. Figures are made by hand using traditional methods and represent the biblical stories. Wherever travelers head to iN Europe during the winter holidays, they will love the sights, sounds, smells, tastes, traditions, and gifts that the Christmas markets have to offer. Travelers may spy Santa Claus and his many colleagues in the Old World: Christkind, Weihnachtsmann, Nikolaus, Krampus, Santa Lucia, the Yule Goat and Tió de Nadal. Some of these characters are anything but a jolly old man, but they only add to the Old World charm and spirit of Christmas travel in Europe! Our team wishes everyone near and far Happy Holidays + Merry Christmas whether you celebrate at home, iN EUROPE or in another beautiful part of the world. This article by iNSIDE EUROPE co-founder Sandra Weinacht was originally written for Travel Professional News. It has been updated for re-publishing. Feel free to share the post, but please give credit to iNSIDE EUROPE – Travel Better Together.